Some song writers have a knack of painting a beautiful picture in their songs which many can recognise. Bob Dylan did it particularly well with My Back Pages which The Byrds showcased beautifully. Bobby Goldsboro and Adele were two more who could do that effectively and this week’s suggestion is all about the Elusive Butterfly painted so beautifully by Bob Lind but is it anything to do with entomology? Read on. Robert Neale Lind was born in Baltimore, Maryland in 1942 and got break at the age of 23 when he signed a record deal with World Pacific records, a subsidiary of Liberty. He was originally working alongside staff songwriter Sonny Bono but due to Bono’s commitments he passed Lind over to a colleague and one of Phil Spector’s team Jack Nitzsche. One of the first songs they recorded together was Elusive Butterfly and it was Nitzsche’s idea to add the string arrangement. 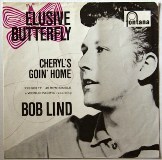 They also recorded a song called Cheryl’s Going Home – which Adam Faith later had a minor UK hit with, but Lind’s version was released as the A side with Elusive Butterfly on the flip. It was only when a radio DJ on station WQAM in Florida flipped it over and played the B side the people began to take notice. “I didn’t invent it with ‘Butterfly’, Bob revealed, “there’s a poem by Yeats called Song of the Wandering Angus that said it about 100 years ago, but that’s the sea I was sailing – the sea of longing.” Lind wrote it as the sun was coming up after staying up all night and said, “The song is about The magic of the quest, the thrill of searching, even when that which is sought is hard to see. Elusive Butterfly is a story of pursuit though most commonly it could fit a man in pursuit of a woman, or a woman of a man, the pursuit could be about anything. That is what makes it great art.” One notable, but not unique things about the song, is that none of the lines rhyme. It transpired a number of years later that Bob had also recorded a much longer version of the song and fans have searched high and low to find it’s proved a bit elusive, like the butterfly. Bob explained, “I wrote it when I was 20 and it was full of sap and blarney. I fought Jack (Nitzsche) tooth and nail to record the long version for the record, but he refused to indulge me and he was right. Looking at it now, it feels fat at that length. I think the edit served it. If someone else wants to record the marathon version, he/she is welcome to it. I don’t have any dictatorial mandates about it. In the UK the song entered the chart at number 48 and the following week it went up to number 21. That same week a cover version by the Irish singer Val Doonican entered the chart at 35 and both versions climbed the chart and both versions peaked at number five. If only one version had been available it could have gone all the way to the top. Lind’s debut album took its title from a line in Elusive Butterfly – Don’t Be Concerned and features 12 songs including Mister Zero which the late Keith Relf, former lead singer with the Yardbirds, had a solo minor hit with. Lind only charted one other song, Remember the Rain which missed the top 40 completely. Lind suffered a few set-backs with drugs and alcohol and eventually split with his record label in 1969 and distanced himself from the music business two years later. In the seventies he got himself sorted out and has been clean since around 1977. In the eighties he had a change of direction and ended writing five novels. In 1991 he wrote an award-winning screenplay called Refuge. In 2004, Bob had an idea and that was to persuade Woody Guthrie’s folk singing son, Arlo to make a comeback, he succeeded and it was done so at the Guthrie Center in Becket, Massachusetts. Bob played live for the first time in years and was re-energised. The pair still tour occasionally today. Bob recorded some new material in 2006 and showcased it on a live CD called Live at the Luna Star Cafe where he also gives some insight into some of his songs. His last album, Magellan Was Wrong, was released in 2016 and, apart from one Tom Paxton cover, they were all original songs. In November 2013, Lind, alongside Judy Collins, was inducted into the Colorado Music Hall of Fame.